South Korea's society has changed massively in the last 30 years, with the roles of the traditionally dominant men and submissive women being transformed. But in one small corner of the country, tradition and customs have never been forgotten — at the Institute Of Etiquette And Wisdom or locally called Yejiwon (禮智院: 82-2-2234-3325), South Korea's ultimate finishing school. For over 25 years, as part of its "bridal course," it has been training selected young women to become accomplished and desirable wives. 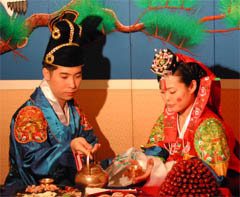 Students learn everything from the complex rules and traditions dictating a formal Korean wedding to the symbolism of food served on special occasions. "As we go into the 21st Century, young people have to know about the culture and manners of the country," Pak Yong-suk, director of the school, told BBC World Service's Outlook programme. "It is to teach these things that I set up the school." Further teaching ranges from how to walk silently and how far to bend the body when bowing, to how a woman should rebuff a man's attempt to hold her hand. 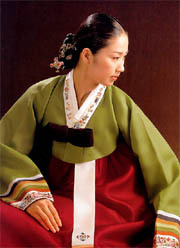 A newly married Korean bride is clad in traditional clothes called Hanbok. Women hope the course at bride school will give them an edge selecting a good husband. They should refuse twice, the lessons instruct, before accepting on the third try. For its detractors, the Institute is an anachronism in one of the fastest-moving countries in the world. But for its supporters, it remains a reminder of a timeless past, teaching valuable lessons that will one day give the girls the edge when it comes to selecting a husband. One example, Ms Pak points out, is that long noodles are served in South Korea on special occasions, but few people know why — it is to wish for a long life and happiness. "Before joining this course, it seems to me that I did not really know about the formal rules of Korean etiquette," student Park Ji-yon — not her real name — told Outlook. "Like most Korean families, we hold ceremonies to remember our ancestors. I knew roughly that on those occasions I had to hold my hands in front of me. Two ladies in early 20s are walking down the in up-scale Apkujong street in southern part of Seoul. Older generations are worried that young ladies have lost traditional manners and virtues these days. "I used to do that any old how. Yesterday I learned that women have to put their right hand over their left, while men put their left hand over their right. "It was something I was roughly aware of, but now I know categorically." In one classroom, the students listen to a lecture on wearing traditional Korean costume. They are told that if visiting the parents of a boyfriend, never wear strapless shoes — especially in the summer. "Walking around going 'clack, clack,' is so ill-mannered," the teacher informs them. "Never wear this type of shoes. If you have to, have some rubber put on the soles." The reason that so many women sign up is the deep-rooted belief that it will give them a boost in the marriage stakes. Park Ji-yon is very explicit about this; her mother, sister and cousin have all previously attended the course. "This might sound a bit funny, but within some families, if you say 'I attended the Institute Of Etiquette And Wisdom', there will be households where you will get added points," she insisted. "It means you are ready for marriage." South Korea places huge importance on the continuation of the family line, and living together before marriage is still greatly frowned upon. This, some believe, makes securing a good match essential. And Ms Pak has advice for staying happily married too. "A woman must never tell her husband what to do," Pak Yong-Suk said. "For example, saying, 'on the way home, go to the supermarket and buy this, this and this, and don't forget' — you mustn't do this. "This is giving an order." The above article is from BBC.